No doubt, there are many lure anglers out there who are already confirmed Albie Snax fans. However, I imagine there is a high proportion who have never heard of them! The manufacturers claim that this is ‘the only lure you need in your tackle box ‘ is a bold one, but I have to admit, this very innocuous looking piece of plastic is rather special. But what are they? Where, when and how do I use them? And why have I come the conclusion that they could be the most effective ‘all round’ lure out there? A late November bass that snaffled an Albie Snax when the ice was actually forming on the rocks behind me (hence the rosy cheeks!). The Albie Snax was designed by an angler called Alex Peru and have been around for a few years now. Made and distributed by a US company called Fish Snax Lures they are a weedless, weightless soft plastic lure weighing 14g and measuring 5″. Essentially, they are two pieces of plastic moulded together (the seam or join is significant) to form one rigid (in comparison to most soft plastics), dense, streamlined and cylindrical lure designed to imitate squid, cuttle and small bait fish, either fleeing or in distress. Innocuous but deadly! They are designed to cast long distances (which they do) and to imitate prey items depending on how you ‘work’ them. You get six lures per packet and there are presently five colours in the range (see above). These are Lite Clear Amber, Amber Gold, White Pearl, Smoke Silver Fleck and Bubblegum Pink. There is a purposely designed and manufactured Albie Snax weedless twistlock hook that you can purchase here which is a size 4/0. However, I tend to prefer using the either the 5/0 or 6/0 Owner (Gary Yamamoto Spec) here or the 5/0 or 6/0 Gamakatsu Super Line Spring lock hooks here. The Gamakatsu also has a slightly wider gape, which I think gives a slight edge in terms of hooking capability. Where, when and how do I use them? I have no doubt that the Albie Snax is deadly in deeper water, judging by the amount of sporting species (bonito, striped bass and largemouth bass) they have accounted for by boat anglers fishing over in the States. 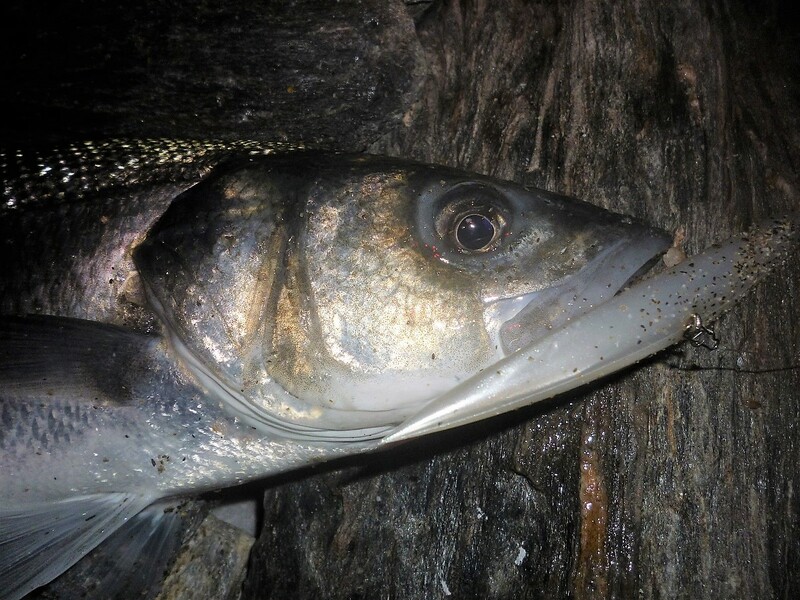 My experiences though, have all been from the shore, primarily at night whilst fishing over shockingly snag ridden territory in water ranging from 6″ to 6′ in depth. I have used them in both flat calm crystal clear water conditions and when a slight swell has been washing onto the beach. Indeed, I think they are even more effective when there is a bit of movement to the sea. They do, cast superbly (40m+) and accurately even into a head wind. Moreover, they very rarely ‘snag’ on either sub-surface weed/rocks or even rocks and weed protruding above the surface if you’re careful. I have to say, that in this respect, they are superior to any other weedless lure I’ve used bar the Lunker City Slug-Go. Occasionally, I let them sink or drift momentarily yet, conversely, I will sometimes speed up the retrieve, in order to briefly fish them on the surface. A twitch on the rod tip or quick increase in retrieve speed will also see the lure dart about (fleeing). First, twist the corkscrew-like device (the opposite end of that attached to the eye of weedless hook) into the top of the lure. Lie the lure on a table with the visible ‘seam/joins’ on the lure facing at 90 degrees to you, if you were looking at the lure from above. The Albie Snax is slightly ‘boat’ or ‘banana shaped’ therefore, to ensure you rig it correctly (so to achieve optimum presentation) keep the straightest edge (the top of the lure) facing away from you and the more rounded edge (its belly) facing you. The hook point is then passed through the rounded edge of the lure and out through the straighter back so that the point sits snuggly and ‘flush’ with the top of the lure (this may take a little practice at first). A White/Pearl Albie Snax correctly and securely rigged onto an 6/0 Owner (Gary Yamamoto spec) weedless/twistlock hook. The video below demonstrates how to rig the lure onto one of the Albie Snax 4/0 hooks, in addition to a nice tip to ensure the lure easily slides around the bend when a fish takes it. 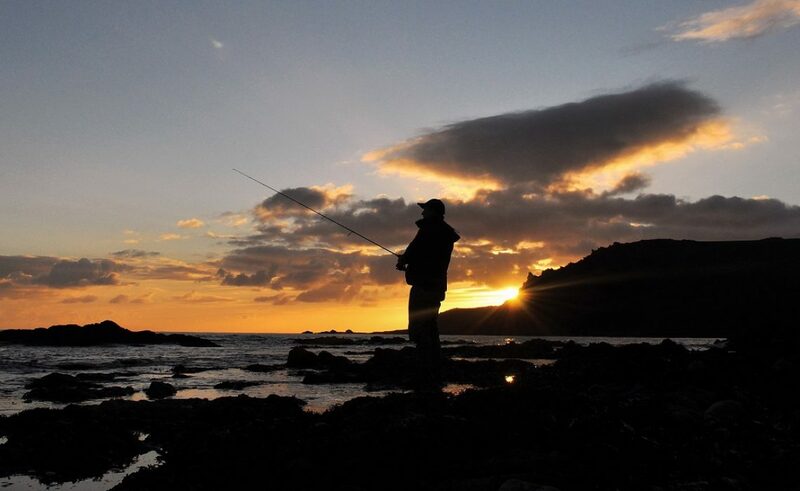 An alternative to Dave Norman of West Cork Bass Fishing’s ‘drill bit’ technique is to manoeuvre the lure around the bend vigorously 7 or 8 times when you first rig it up. Be careful not to go overboard with this though, as there is a fine line between the lure comfortably sliding around the gape of the hook when a fish hammers it, to it sliding (annoyingly) around the gape every time you cast as it – rendering the lure useless. To summarise the attributes of the Albie Snax I considered the places I can use them, their ease of use, casting ability, versatility, cost and of course, how many fish they catch. I only started using them myself at the start of September 17, but they were just so effective, so quickly – to the extent that I would use them (exclusively on occasions) to search out new ground whilst out on my own or with a fishing companion. Something that is worthy of a mention, is that when I have received ‘a hit’ (but no hook up) I’ve cast and retrieved into the same area and hooked the culprit next time around on quite a few occasions. For me, this is quite an uncanny and relatively rare event when bass lure fishing, as more often than not a bass is spooked when this occurs, unless it really wants that lure! My client (Nick) from back in September with an Albie Snax caught near 5 pounder. I was stood right next to him when the rod slammed down! The fish took about 5 metres out from the beach in about 12″ of water. It made the 0230 start worth it that’s for sure! They cast extremely very well – consistently so. They are inexpensive (costing around £7 per packet) and when rigged onto one the hooks mentioned they will cost you approximately £2.27 per lure. They are highly effective whether they’re fished in 6″ or 60′ of water it seems. You will very rarely lose one as the rigid nature of the body helps to prevent it snagging up. They are extremely robust and durable – one lure can withstand repeated hook ups. They are very, very easy to use – most of the bass caught took the lure on nothing more than a straight retrieve – a very simple method. They are versatile in the sense that if you do decide to ‘work them’ in a different way, they will mimic a squid, fleeing fish, a disoriented or wounded fish on the surface, or indeed a small fish completely oblivious to attack. Seemingly, so far they have tended to pick out the larger bass! Does this fantastic lure attract the larger specimens? My client (Michal) only received the one bite in a 4 hour guided session, which occurred after I switched him over to an Albie Snax. The result was the biggest ‘client caught’ bass of my 2017 guiding season at 70cm (easily 8lb+). I imagine by now your thinking OK, OK! so where can I buy them Marc!!! They can be purchased from the online lure fishing specialist Lure Fishing for Bass here. My thanks to them for bringing these lures to my attention and to David Norman for allowing me to embed his YouTube video within this article. As ever, I welcome any feedback, comments and observations and would love to hear from you in relation to your own experiences. Thanks for reading – roll on the new season! Hi Brian, I haven’t but it’s a bloody great idea! Yes, the senkos (in white) did very last season. I was using 6″ versions but I have some 5″ wave worms ready to go! I tended to commence a session on a senko (in darkness), specially if it was REALLY calm and clear.